The Winnipeg Jets haven’t had the most auspicious of starts to their 4-game road trip. Losses to Calgary and Minnesota left the Jets feeling like they’d left 4 points on the American Thanksgiving buffet table. The loss to the Wild was particularly stinging, considering the Jets held the edge early in the game and were dominant for several stretches. 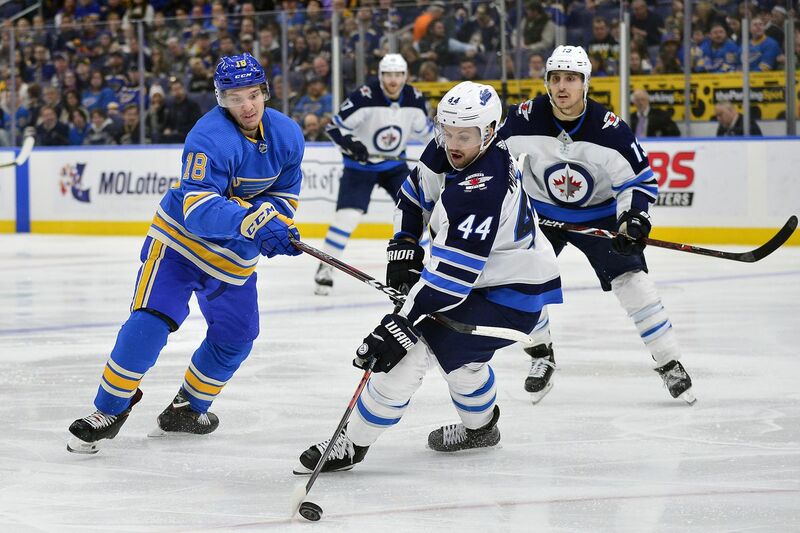 Would a match-up against the St. Louis Blues be the remedy to what ailed Winnipeg? The Jets typically match well against the Blues, and tonight was no exception. Winnipeg exchanged some early scoring chances with St. Louis, leading the shot clock early. Despite the end to end action, both teams went scoreless for most of the period. Blues netminder Chad Johnson was the busier of the two goalies, but must have felt relieved when David Perron opened the scoring late in the first. Usually, an early opposition lead causes Winnipeg some grief, but Blake Wheeler was having none of it. A deflected shot off of a Blues skater fluttered over Johnson’s shoulder, tying the game. Less than a minute later, Patrik Laine continued his scorching-hot form and ripped a one-timer to give Winnipeg the go-ahead goal. Incredibly, Vladimir Tarasenko scored a minute and a half later on an incredible wrap-around opportunity, evening the score once again. With 4 goals in less than 10 minutes, you’d be forgiven for wondering where the goaltending was. Winnipeg got back to business from the puck drop. Laine is one of the greatest natural goalscorers, and reminded everyone why his “Ovechkin Office” power-play shot makes the ice quake, scoring just under 2 minutes into the second period. Both teams finally agreed to stop scoring for a bit, with the Blues struggling to generate offense against Winnipeg’s pace. Brandon Tanev felt a bit excluded from the action, and put himself on the scoresheet after collecting his own rebound and stickhandling around Johnson for a slick marker. Laine was annoyed than someone other than himself was doing the scoring, and collected a Kyle Connor feed on a 3-on-1 to complete his hat trick. A hat trick, however, was not quite enough. Just a few minutes before the end of the period, Laine collected a bad Blues turnover and ripped it right over Johnson’s shoulder. That ended Chad’s night, and St. Louis exited the second period in a 6-2 catastrophe. Somehow, things got worse for the Blues. Jake Allen was welcomed to the game with yet another Laine goal, this one off of a Bryan Little pass from the boards. I’m not entirely sure how the Blues found a way to leave Laine completely unmarked, but they paid dearly for it. Laine got his fifth goal of the evening and also scored one lucky winner $1 million. Not a bad night for all involved, to say the least. 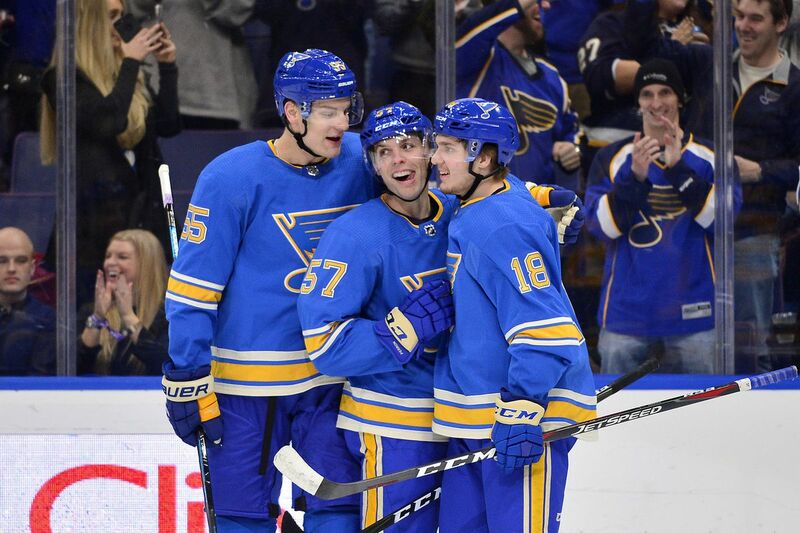 To St. Louis’ credit, they did attempt to spoil Winnipeg’s celebratory dance, generating some dangerous chances against a shakier Laurent Brossoit. Ryan O’Reilly and Patrick Maroon cut the deficit to 7-4, putting a light damper on Laine’s dominance. Brossoit was the source of the O’Reilly goal, having a bit of an adventure while playing the puck around the net. The Maroon marker was a nice individual effort on the power-play, but Brossoit would probably feel that was his responsibility to seal off. Thankfully, Winnipeg’s fourth line eased any remaining tension with a fluttering puck that deflected off a Blues stick and into the net. Jack Roslovic’s attempted cross appeared to be the goal, but Brendan Lemieux was credited with the finishing touch. Time will tell if Roslovic is awarded the goal, but it was a nice sequence for a line that’s generally been good in limited minutes. Patrik Laine is on some kind of heater, man. He went from scoring on the power-play occasionally, to filling the net on every shot he takes. Not too shabby, Patty. The team had a few lapses here and there, but the first 40 minutes tonight were pretty strong all around. This was a good responses to 2 straight defeats. Goaltending wasn’t so great for either party. Brossoit struggled a good deal, but that’s to be expected every now and then. Laine didn’t get more than 5 goals. Cara’s gym only plays CTV, so she missed seeing Laine score five goals.